The Flex Plus FreeStand is ultra adjustable with easy, tool-less control of camera and monitor position. The monitors are *(1) self-reversing and can display prompting with either the included PC and Mac software or with any presentation software such as PowerPoint or Keynote. *(1) The text reflection in glass reads backwards. Our monitor reverses the text so it is readable out of the box. 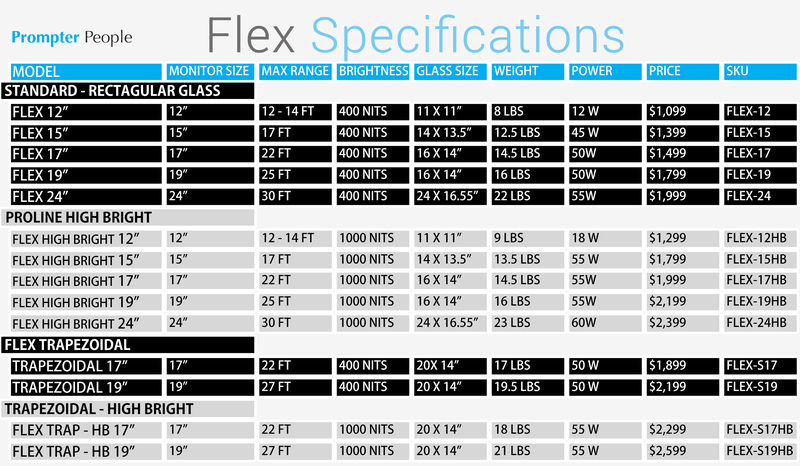 Upgradable from 12 to 15, 17, 19, 24, and 32 inch monitor sizes. The Flex Plus Freestand teleprompter’s patent-pending design utilizes custom aluminum extrusions for high strength, featuring lightweight and tool-less setup and operation. The unique design offers perfect balance for any size camera from a palmcorder to a full size ENG camera. The included monitor offers a variety of inputs including VGA, composite and HDMI. The lightweight, long life LED backlit display offers a bright 400 nit image (nit is the unit of visible light intensity). The Flex 12 can be quickly and cost effectively converted to an iPad or to a 15, 17, 19, or 24 inch prompter for ultimate flexibility.